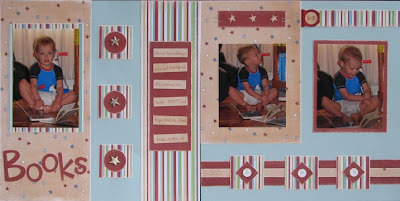 These are the pages and cards that I created for the design team in July 2008 for Apronstrings Designs. This is the Smaller than a Bread Box kit and I really liked working with these papers . 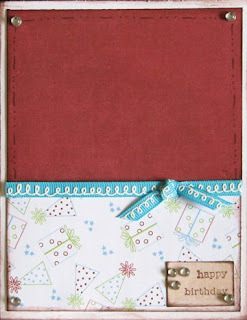 With the designing of these kits, we are to create at least 3 2-page layouts and a card or tag with the scraps. We are to use only what is in the kits (except for stamps and die cutting machines). This kit is still available (but they do sell out of their kits, so hurry over if you want to pick one of them up. They also have the August kits available for sale to those without the auto-ship. They are such wonderful kits, I told them to send them both to me because I couldn't decide which one I wanted more. On the above kit the papers are from KaiserCraft, the cardstock is Bazzill, the ribbon buckle is 7 Gypsies, the brads are Doodlebug, and the flowers are Heidi Swapp. I used my cricut with the Opposites Attract and Plantain Schoolbook cartridge to cut the titles. 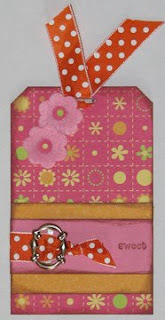 I also used a Stampin Up stamp on the tag. With this kit above, the patterned papers are by gcd studios, the cardstock is Bazzill, the black trim is Doodlebug, and the chipboard scrolls and sheer scallop journaling card are Maya Road. 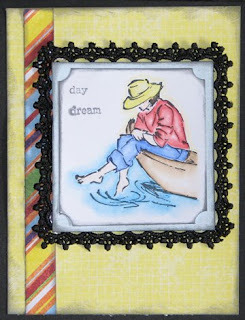 I used my cricut and Opposites Attract cartridge to cut the title and Stampin Up for the stamped image on the card (with the MCPT - Gamsol Technique to color it in) and the lines for the journaling on the yellow patterned paper. I am not sure what stamps are used for the bracket and the flower (I am thinking they are from my 7 Gypsy's set, but I am not sure). For this last kit, I used patterned papers from Dream Street, cardstock is Bazzill, the metal tab is 7 Gypsies, the ribbon and assorted clear droplets are Carolee’s Creations, the stamp set I used for Happy Birthday is from Stampin Up and I cut out the title with my cricut and Cuttin Up cartridge. Amy, these creations of yours are absolutely out of this world! I wish I was nearby so I could come over and look at each one in real-life! They are colorful, festive and cuteness all over! I love the beach layout! I'm guessing your baby is a boy. Good luck! !